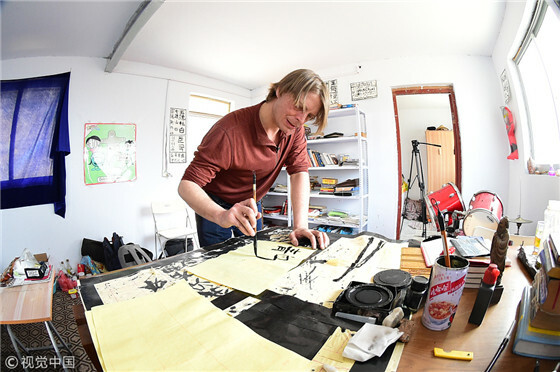 Without a smart phone and no connection to social media, a 43-year-old American man lives a hermit-like life on a mountain in China, where he's dedicated his time to translating classic works of Chinese philosophy into English. His Chinese name is Dai Ling, "Ling" in Chinese means "mountain", which is a reflection of his hermit's life. Dai Ling lives in a small bungalow on a mountain in Qingdao, East China's Shandong province. For the past 10 years, Dai has translated Tao Te Ching, a classic text written by Laozi, one of China's most influential philosophers who lived about 2,500 years ago . Given the fact that the 5,000-word book is written in classical Chinese, and many of the words are vague and ambiguous, it can be difficult to understand, even for well-educated native speakers of modern Chinese.